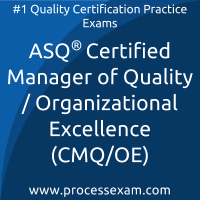 Test yourself using our Premium practice exam of ASQ Certified Manager of Quality/Organizational Excellence (CMQ/OE) exam. Be firm and assured on your readiness on your ASQ CMQ/OE exam preparation. Our ASQ CMQ/OE practice exam gives you the platform to test your knowledge on a set of refined and recently updated questions. Premium ASQ Certified Manager of Quality/Organizational Excellence questions bank contains 740+ questions, Premium Practice Exam will populate questions randomly from this question bank. All the questions from premium question bank will be covered easily in 4 to 6 practice exam attempts. However the more you practice, the best will be the result in real exam.